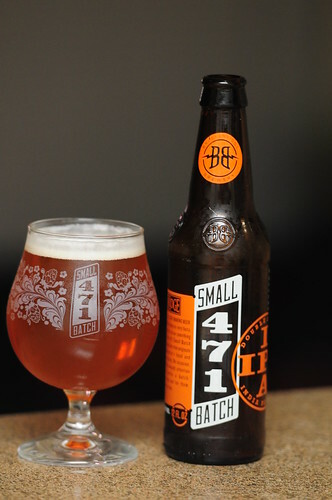 Breckenridge 471 IPA, originally uploaded by adambarhan. A – Poured a very very clear, bright burnt orange amber. A nice about one inch head graced the top from the very beginning, this slowly faded to reveal just a film across the top. No significant side glass lacing on this one. Decent carbonation could be seen rising up from the bottom of the glass. Nice overall look. A – Lots of piney citrus likes hops dominated the aroma. But the story was much more complex then that. Lots of balance was present as well. Some good earthy grains and sugar were also present and well represented. Nice balanced smell nothign really blowing you down in either direction. T – Wonderful. For a strong Double IPA simply great. Super smooth with a delicate underlying malt layer. Lots of sweet orange peel and sugar, a hint of some grapefruit. Very nice fresh cut grass flavor as well. Alot more complex then your typical hop bomb. Very well crafted. M – Decent carbonation led to a good mouthfeel. Nothing slick or oily. D – Although the 9% abv by no means feels that strong, you can tell this was one that you just dont gulp down, for sure. Overall This was a Great brew.